Hometown-like and adventurous? Challenging and supportive? You must be talking about the University of Alaska Southeast—it’s our opposites that attract our students. UAS is small enough your professors know you by name, yet we offer a world of opportunities. The largest of the schools at UAS, School of Arts and Sciences is comprised of four departments: Humanities, Social Sciences, Natural Sciences, and Business and Public Administration. The Alaska College of Education administers all University of Alaska education departments and their teaching and education leadership programs. With training labs and facilities in Juneau, Ketchikan, and Sitka, the School of Career Education focuses on workforce development in industries essential to the Alaskan economy. These facilities, including the UAS Maritime Training Center in Ketchikan and the Center for Mine Training in Juneau, specialize in teaching power technology, construction technology, welding, maritime trades, health sciences, fisheries technology, and more. 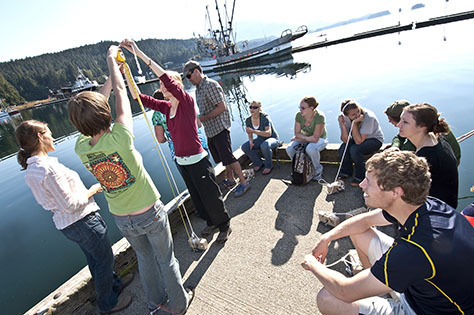 The University of Alaska Southeast offers a broad range of study designed to meet the needs of Alaska, with special emphasis in marine biology, biology, education, business, outdoor studies, fisheries, workforce development, and maritime training. Whatever your field of study, UAS is known for high-impact, experiential learning opportunities that studying here like nowhere else. Innovative bachelor’s degrees in the liberal arts and social sciences combine a program core with interdisciplinary and designated emphasis courses—flexible degrees that are offered both on-campus and online. The UAS Academic Catalog is a complete guide to degrees programs, course descriptions, academic and institutional information, student rights and responsibilities, student services, admission, financial aid, fees and expenses, and registration. The UAS Class Schedule lists on-campus and online classes. A printed schedule is distributed for Fall and Spring semesters. The University of Alaska Southeast has been accredited by the Northwest Commission on Colleges and Universities (NWCCU) since 1983. Alaskans are adventurous people and many of our students want to experience other places and cultures. Whether you want to continue working on degree requirements, learn a new language, or explore a new area of study, UAS Exchanges and Study Away will guide you through the process. Students can go on exchange in the U.S. and 50+ countries at over 300 colleges and universities. Are you curious about Alaska? Come experience the culture, the landscape, and the people for yourself through Student Exchange! The University of Alaska system is comprised of 16 campuses throughout the state, organized under three regional universities: The University of Alaska Anchorage (UAA), University of Alaska Fairbanks (UAF), and University of Alaska Southeast (UAS). *Select programs offered at a campus may be administered by another university. Fisheries and Nursing programs at UAS are administered by UAF. Teaching and Education programs at all three universities are administered by UAS.